The Power of Zero, The Dash for Trash and The Economic Growth Path - Epoch Investment Partners, Inc.
Few, if any, variables matter more than interest rates in determining economic and financial outcomes. And the past several years have proven to be no exception to this point. Since the beginning of the global financial crisis in the summer of 2007, we have witnessed a collapse in equity prices and a contraction in real global GDP rivaled only by the Great Depression. In response, governments and central banks took action on several fronts. 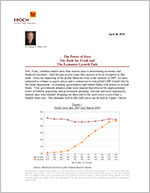 First, government stimulus plans were enacted that allowed for unprecedented levels of liability guarantees and government spending. Second, and most importantly, interest rates were slashed, dropping the short end of the yield curve to just a hair’s breath from zero. This dramatic shift in the yield curve can be seen in Figure 1 below. The impact of those astonishingly low interest rates is our focus here. Let’s start with Figure 2, which shows what happens to the value of a dollar when the discount rate changes from a high number to a lower one. Should the discount rate fall from five percent to one percent, for example, the present value of a dollar due 20 years hence climbs from 38 cents to 82 cents: an increase of 215%. As Figure 1 demonstrates, the longer the duration of the asset in years the greater the impact of a decline in the discount rate. When the discount rate shifts from five percent to one percent, an asset with five-year duration rises 22 percent whereas an asset with 30-year duration gains more than 320 percent. In the case of a 30-year asset with option-like characteristics, its value explodes upward as rates approach zero. Source: Epoch Investment Partners, Inc.
With the lessons of Figure 2 in mind, let’s take a look at a real-life example. As shown in Figure 1, from the summer of 2007 through today, Treasury bill rates fell almost 500 basis points while 20 year interest rates declined less than 100 basis points. This downward shift in the yield curve lowered the discount rate applied to all financial assets. While one can debate whether it is the short-term or the long-term rate level that most affects equity valuations, either way, it is clear that such a shift has a powerful effect on valuation and favors the asset with the longest duration and highest volatility. Equities that possess option-like characteristics will be affected more than the equities of companies with real cash flows and solid balance sheets. Figure 3 offers yet another way to see the effects of this massive injection of liquidity by the central banks and the accompanying decline in interest rates. Figure 3 is the Bloomberg Financial Conditions Index1, as expressed in z-scores. This chart shows that in the summer of 2007, an episode2 occurred that triggered a negative two standard deviation event. The index staggered for over a year until it finally collapsed with the Lehman bankruptcy and the failure of AIG – an amazing 12 standard deviation event. The index reached its nadir in October 2008; consider however what has happened since that time. Today, the index scores a positive 0.5 or one half of one standard deviation better than its historical average. Indeed, we are back to the level preceding the Paribas incident. This index is effectively the mirror image of the cost of liquidity and reflects the power of zero when combined with the liability guarantees on financial assets provided by governments around the world. The power of zero is also apparent in the data presented in Figure 4. Here we see the performance of the companies in the S&P 500, with and without earnings. The firms without earnings who were shaky financially, and in some cases facing bankruptcy, performed better than those with earnings. The more option-like the equity, therefore, the better it performed over the past year as interest rates approached zero and the cost of liquidity collapsed from the incredible 12 standard deviation level shown in Figure 3. While the valuation component driving equities has soared over the past twelve months, what has been going on in the world of the real economy and corporate earnings? Without the government’s stimulus package, the likelihood of an economic catastrophe was extraordinarily high. The collapse in final demand from the private sector, as reflected in consumption and investment, was so large that no substitute for this loss of demand could have occurred without a massive increase in spending by the Federal government. One can argue about the programs, their scale, their effectiveness, and even their waste, but something had to be done or a true disaster would have occurred. However, the effect of the stimulus package is running out, as illustrated in Figure 5. A sustainable recovery requires a transition from government stimulus and inventory restocking to one that reflects an increase in private sector demand. For that to occur, we must create jobs. Employment must be higher a year from now, and the employed population must experience higher income levels or the risk of another recession is quite high. We believe one will see rising employment but it will be modest in scale, averaging just over 100,000 jobs per month. This is about the amount needed to keep the unemployment level close to where it is now – just under 10%. The good news in the short run lies in corporate earnings. Forecasted earnings for the S&P 500 have risen for 10 consecutive months and now exceed $75 for 2010, suggesting a modest earnings multiple of 15 or so. Estimates for 2011 may be nothing more than extrapolations, but they are in the $90 range currently. For that number to be realized, private sector demand must significantly improve and/or productivity gains must continue to surge. Another bright spot is in the realm of corporate balance sheets, which are extremely strong for the S&P 500 ex-financials. Cash exceeds $900 billion and is 9.7% of corporate assets excluding the financial sector: a record high. Look for rising dividends and an increase in stock buybacks throughout 2010. In February alone, 47 companies in the S&P raised their cash dividend. With top-line growth expected to be very modest, M&A activity will also be strong for strategic buyers as corporate CEOs attempt to grow their businesses. In conclusion, it is clear that the power of zero has certainly had a dramatic impact on the recent history of the stock market. However, we believe it has run its course with respect to valuation influences. Future gains in the stock market will reflect the success of an economy transitioning to one led by the private sector. Corporate earnings momentum will contribute to this growth, as will strong corporate balance sheets. Critical external factors, particularly sovereign debt concerns, will have to be faced and the balance sheets of state and local governments must improve. China needs to continue to grow and protectionist actions by our Congress must be held to a minimum. All of this, however, will take place on an increasingly unstable political foundation. As evidenced in the popularity of the Tea Party movement, Americans have become disillusioned with their institutions. Congress is held in contempt by most Americans and the Federal Government might as well be located on Mars from the point of view of the average citizen. Yet we have been here before; almost 75 years ago in fact. The prevailing attitudes of pessimism and distrust were as strong then as they are today. If we are to emerge once again from this morass of anger and alienation, we must renew our understanding of what makes our nation strong. America has a culture unique in the world. If we can identify our shared values and find a center in our governance structure, we will go on. If we cannot do that and if we fail to transition to a private sector-led recovery with employment gains, then we will indeed be an empire on the edge of collapse. As investment managers, our task is to navigate this complex landscape in a way that protects and grows invested capital. To do so, we identify those companies that will prosper over the long run through wise capital allocation and ignore those entities whose fortunes reflect only the “power of zero” over short time periods. With interest rates at present levels, that latter game has come to an end in our view, but Epoch’s investment philosophy remains consistent. Firms that generate free cash flow and management teams that deploy this cash flow for shareholder value creation will win. These are the companies we seek to own in our portfolios. 1The Bloomberg Financial Conditions Index combines yield spreads and indices from the money markets, equity markets, and bond markets into a normalized index. The values of this index are presented as z-scores, which represent the number of standard deviations from which current financial conditions surpass or lag the average of the 1992-June 2008 period. 2Paribas Bank could not meet redemption requests on a fund it managed, triggering a major liquidity injection into money markets first by the ECB and then a day later by the U.S. Fed.